Request a phone call or chat live with a Game Advisor. Scan your computer to ensure everything is Pogo compatible. 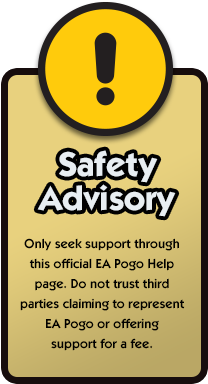 Receive assistance from helpful Pogo players. Get assistance signing in to Pogo or recovering a lost account. Get helpful advice from your fellow Pogo players in the forums. Get assistance with Download Games in the Download Games Help Center. Browse our archive of helpful articles for solutions to many common issues. Beware of fake Pogo help sites and phone numbers. Please click here to read more.